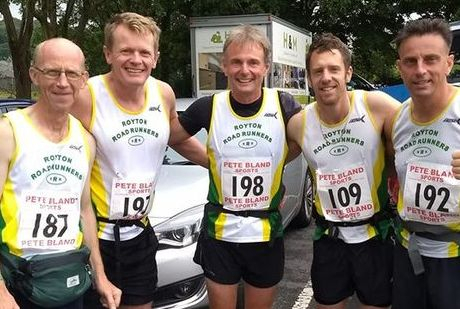 This well-established Fell Race Grand Prix involves several local running clubs - including Middleton Harriers, Rochdale Harriers & Saddleworth Runners - with Royton Road Runners joining for the first time in 2012. RRR Rob James, competing for the first time, was the overall champion in 2018. The 2019 series is made up of 12 mainly local fell races - see the full list below & click on the links to each race for more details. Just like in the RRR (road race) championship, points are allocated for each race completed, with the best 5 scores counting for each individual. If you want any more information about this race series, please let me know! can be found on the Fell Runners Association (FRA) website. Click here for the official Run The Moors site, including points tables. Click here for the full current FRA Safety Requirements & Rules for Competition. If you are planning to take part in an FRA-registered race you should plan to arrive at the start with (as a minimum) waterproof full body cover (with taped seams & integrated attached hood), hat, gloves, map of the route, compass, whistle & emergency food, with a bumbag/pack to carry them in. These may not all be compulsory for every race (although they are considered best practice), but you won't know this until you arrive at the start. Race organisers are obliged to carry out random kit checks before the race & can refuse to allow runners to participate if they do not have the required kit. Please check the FRA website for details of each race you plan to run & contact the organiser if you need any further information.